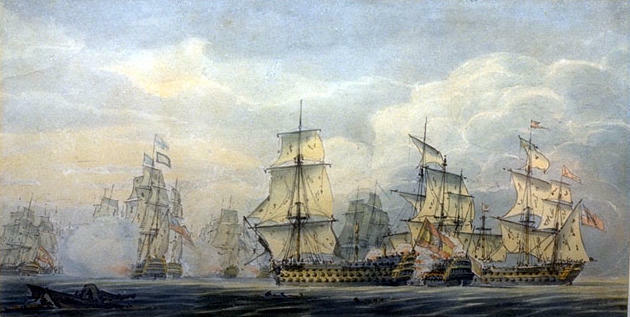 "England expects every man to do his duty"
On October 21, 1805, the British Fleet commanded by Lord Horatio Nelson met the Combined Fleet of France and Spain off the coast of Spain at Cape Trafalgar. The British victory in the ensuing battle inaugurated British naval dominance for over one hundred years. But in the midst of the battle, Nelson was mortally wounded by a sniper from the French ship Redoutable. It was his last words that it was his lot for me to go but I am going to Heaven, but never haul down your colours to France for your men will stick to you - them words was to Captn. Hardy and so we did - for we came off victorious and they have behaved well to us for they wanted to take Ld. Nelson from us, but we told Captn., as we brought him out we would bring him home, so it was so and he was put into a cask of spirits. And thereupon hangs a legend: supposedly when the cask arrived in England it was discovered to be less than full. The sailors of Victory had sampled the Nelson vintage. From this incident, its is claimed, the phrase "tapping the admiral" arose, although this is not a phrase you are likely to hear very often nowadays. British sailors formerly said "tapping the admiral" for drinking rum, against regulations, out of a coconut from which the milk had been drained; later the phrase was used for drinking surreptitiously from a cask by means of a straw inserted through a small hole. Nelson's body was preserved first in a cask of brandy - at Gibraltar, this was changed to spirits of wine - lashed to the mainmast [of Victory] and guarded day and night by a marine sentry as his cabin had been. On December 4, 1805, Victory bearing Nelson's body arrived at Spithead. Nelson's body was removed from its cask and an autopsy was performed. The cask could not have been too short upon its arrival in England for the autopsy noted that Nelson's body was well preserved which would have been unlikely if the cask was so low as to expose the body to air. The body was returned to its cask and the Victory continued on to London arriving at the Nore on December 6. Nelson's body was removed from its cask and transferred to a coffin and transported to Greenwich where it was to lie in state before burial. Nelson was buried on December 9, 1805. Pocock makes no mention if the cask was low upon arrival at Spithead or the Nore. If the cask was stored above decks it would have been exposed to the elements which are not calm at that time of year. The British fleet was struck by a gale immediately after the battle that sunk twelve of the sixteen ships that had been captured. It might not have practical or pleasant for the marine guarding the cask either. Could the cask have been stored below deck? The gun decks doubled as living quarters for the crew. The orlop deck was cramped and it was impossible to stand upright there. The holds were not regularly frequented and probably not considered an honorable place to store Nelson's body with its attendant guard. I would guess that the cask was stored on one of the three gun decks. Lest anyone think that the guard was posted to prevent sailors from drinking the contents of the cask, officer's quarters were guarded by marines and posting a guard over Nelson's body should be viewed as a continuation of that honorary duty. The ship's company of the Victory were as grief-stricken [as the officers]. "Great God!" a seamen had exclaimed on hearing the news, "I would rather the shot had taken off my head and spared his life." A boatswain's mate was unable to pipe the hands to quarters because of his tears. "Hang me, I can't do it!" he sobbed. "To lose him now! I wouldn't have cared if it had been my old father, brothers or sisters if there were fifty more of them - but I can't think of parting with Nelson." An uneducated seamen, James Bayley, wrote from the ship to his sister, telling his story of the battle and the death of Nelson: "It was his last words that it was his lot for me to go but I am going to Heaven, but never haul down your colours to France for your men will stick to you - them words was to Captn. Hardy and so we did - for we came off victorious and they have behaved well to us for they wanted to take Ld. Nelson from us, but we told Captn., as we brought him out we would bring him home, so it was so and he was put into a cask of spirits." Would sailors that respected Nelson go so far as to steal drinks from his cask? It is possible but unlikely. The circumstances of his death were an echo of the Christian tradition: the sacrificed savior of his people. Not only was the immortality of his spirit emphasised but there were familiar figures in the background: the twelve surviving members of "The Band of Brothers" [the captains of British ships that Nelson commanded], his disciples; even a female figure striking allegorical attitudes: a Mary Magdalene as imagined by Romney, perhaps. An element of love was inherent in all the memories of him; sometimes from direct experience of friendship or loyalty; more often from his reputation for generosity and humanity. That he had offended against his own standards of conduct had surely been redeemed by his blood. Many wandering Englishmen actually did end up being shipped home inside barrels of spirits after they died abroad, and in numerous instances the barrels were supposedly (who can say?) tapped, presumably always unwittingly. Yet, in this case, the tapping was done with full knowledge of the contents. Significant? You be the judge. I welcome any comments, sources, pointers to "tapping the admiral" trivia that you may have. Please send them to me!